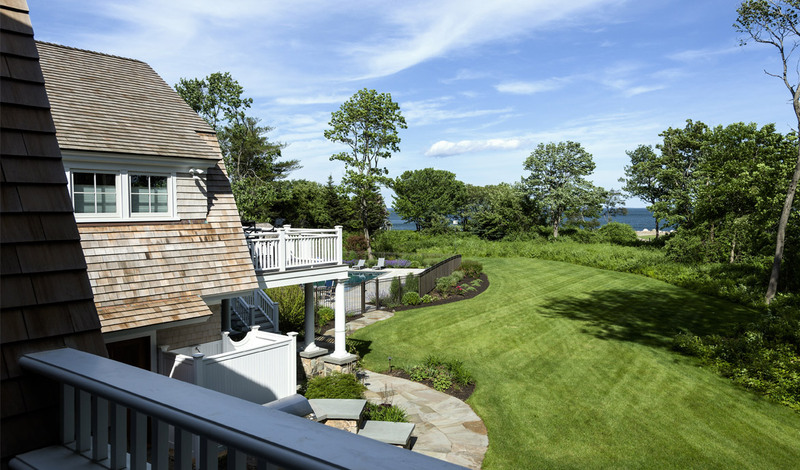 The homeowners of this seaside gambrel acquired an untouched oceanfront lot with the wish to turn this beautiful piece of land into a quiet retreat for their use after retirement. This very inspiring site had a number of challenges, including the clients’ wish to save some existing mature trees and the elongated shape of the site which made siting the residence a difficult task. The final location of the new residence, close to a cul-de-sac, created a quiet haven as well as provided stunning views of the Atlantic Ocean. The living spaces are oriented to maximize the views of the gardens and the water. The open concept of the first floor extends onto a centrally located generous patio that contributes to the strong link between the outside and inside of the home. 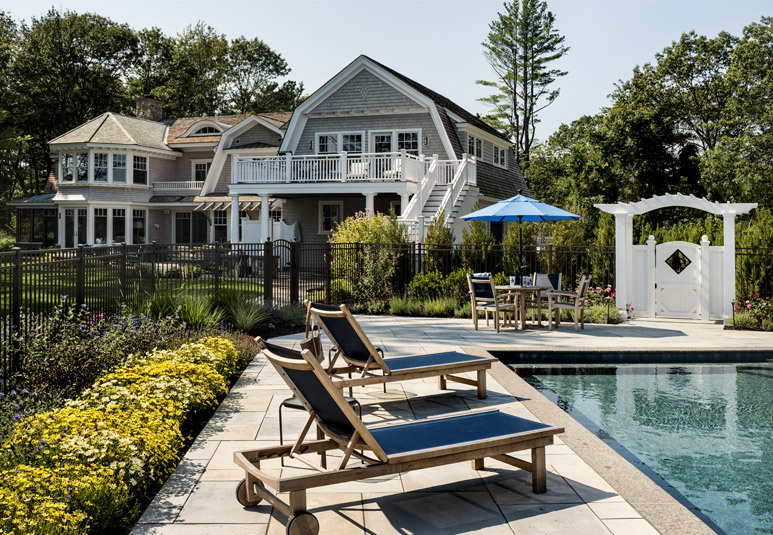 The clients’ desire to save existing trees and reuse existing architectural elements was a design guideline followed by the architectural team. As an example, the homeowners wished to reuse an existing stainless steel sink and drainage board in the mudroom. A galley-style mudroom was designed to incorporate this unusual sink. The combination of recycled and new elements all contribute to the beauty of the home. 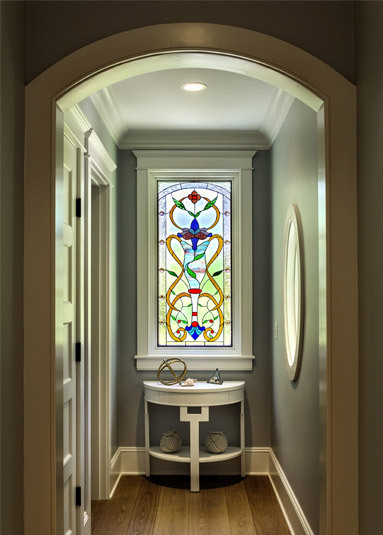 Another personal touch is the custom stained glass windows created by the client’s father. 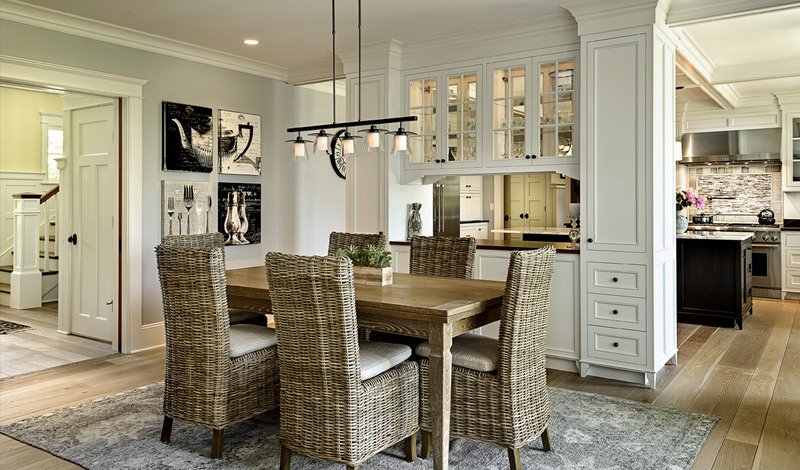 These windows are located as focal points in the hall and pantry and provide the home with a dramatic touch of color.